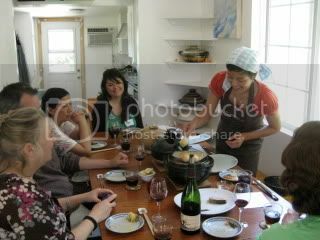 This past weekend, I was invited to do a "private" donabe and Japanese cooking class for 12 ladies, and it was a lot of fun! 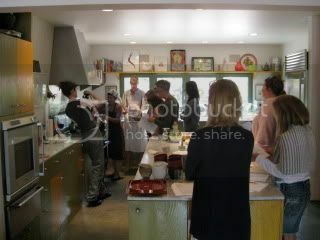 The class took place at a private residence of the host of this event...it was a special class for to celebrate her birthday. The theme was Japanese Vegetarian. 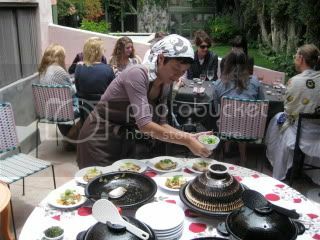 We cooked 5-course lunch menu, and at the end of the class, everybody sat down and enjoyed the healthy Japanese vegetarian meal. I was very lucky to be given an opportunity to offer a class to these wonderful people. 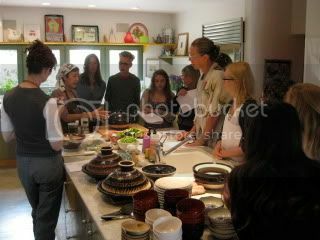 They were enthusiastic to learn the donabe and Japanese cooking, and they were very nice. 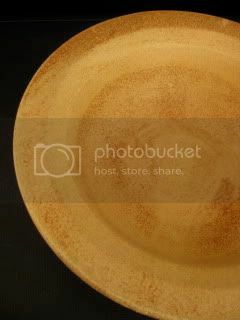 I didn't get to take pictures of all the dishes we made, but here are some of them. 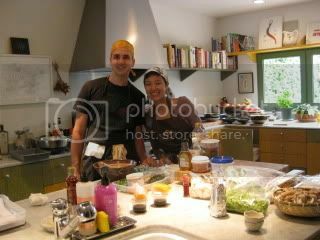 My volunteer sous-chef, Jason, helped me so much during the class. Arigato, Jason. I'm already so in love with my new donabe, the handleless donabe, "Yu-series, Kizeto". So, as soon as I finished staring it, I seasoned this new donabe. 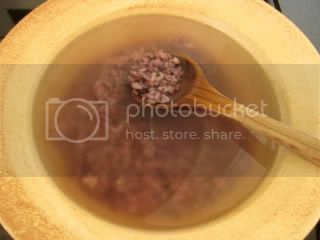 Seasoning a donabe is an essential first step before start cooking with it. It's a one-time process, and once it's seasoned, you can use this quality Iga-yaki donabe for many decades with the proper care. 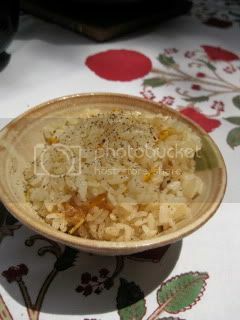 You first combine the water (about 70% full) and leftover cooked rice (at least 1/5 volume of the water). I happened to have the leftover "purple rice" (white rice with a little amount of black rice), so my mixture is purple! Simmer the mixture over low heat and stir occasionally. 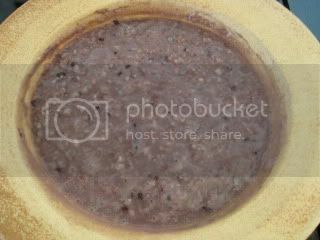 The mixture starts to become like thick porridge after about 30 minutes. After about 1 hour, the mixture has turned like paste. I turned off the heat and let it cool down about 1 hour before discarding the mixture from the donabe. Then, I just rinsed the donabe with mild soap and dried it completely. That's it! It's really easy. 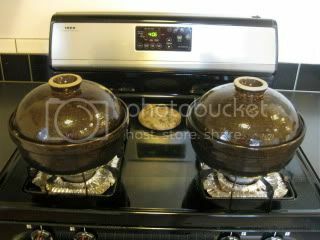 You can find the step-by-step "How to season donabe" instructions on toiro's website. As I was so excited about this new donabe, I made my first dish with it on the same night. I made a light broth and simmered yuba (tofu skin), okra, and seaweed. The donabe body is not very deep, so it was great for the quick simmering dish like this. It was so wonderful. Happy donabe life. Once you own a donabe smoker, "Ibushi Gin", let me warn you...you might get addicted, because donabe smoking is so much fun and so delicious. The other night, I got two donabe smokers going and smoked different ingredients. This time, I used hickory wood chips, instead of our regular sakura (Japanese cherry blossom) wood chips. 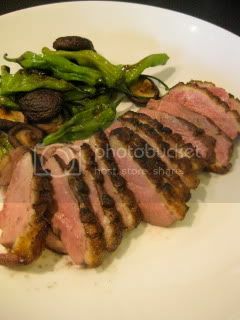 Muscovy duck breast came out so smoky and juicy. 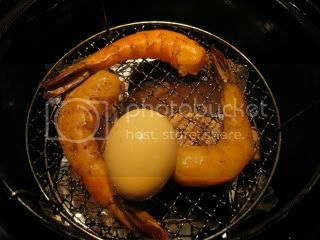 Smoked jumbo shrimp and eggs are also always among my favorite. I never get tired of donabe smoked dishes. 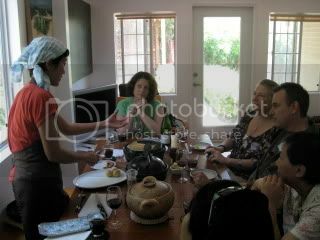 I also hosted another donabe smoking class and had a wonderful time with the wonderful guests! 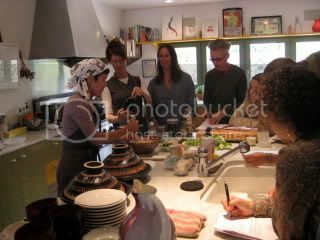 Sorry that it's taking time, but our July donabe & Japanese cooking class schedule will be announced very shortly, so please stay tuned! I am so happy to announce that the new shipment from Iga, Japan, have just arrived. So, everything is back in order now and you can order from toiro's website. I am also very happy to introduce a new donabe item in our lineup. It's a classic-style all purpose donabe with a unique design. It's a light-weight handleless donabe, called "Yu-series, Kizeto", and it's also an authentic Iga-yaki donabe made by Nagatani-en. When I first took this donabe out of the box, I just stared and checked out all the details of it for about 15 minutes. It's so beautiful that I just couldn't keep my eyes off it! Yu-series is Nagatani-en's light-weight donabe/ ceramic series, and this medium-size Kizeto weighs just slightly above 3 pounds(! ), so it's very handy. Also, it's stemless and the wide rim makes the donabe easy to lift. 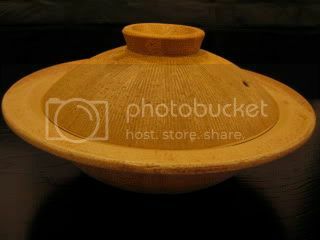 This donabe looks almost like a flying saucer! The details of this donabe are remarkable. The unfinished "wabi-sabi" look would make you feel peaceful. 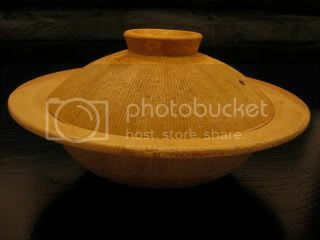 This donabe is good for cooking wide variety of dishes, such as hot pot, stew, quick simmer, etc., or it would also work as a serving bowl for a beautiful presentation at a dining table. 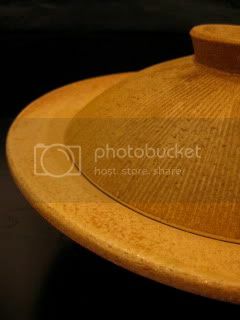 You can find more details of this donabe at toiro's website. 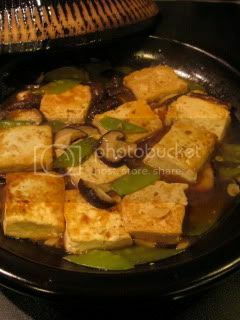 After enjoying the simple sizzling shishito peppers with shochu cocktail, I made myslef tofu steak and purple rice. 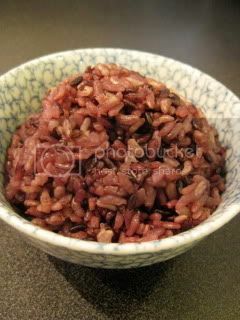 The purple rice was, again, 1 rice-cup of each white and (semi-polished) brown rice, and 3 table spoons of black rice. 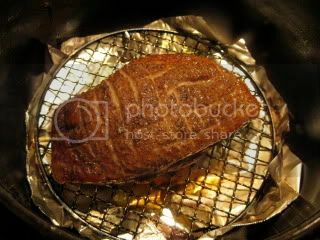 It was cooked with the double-lid donabe rice cooker, "Kamado-san". I love my donabe life. 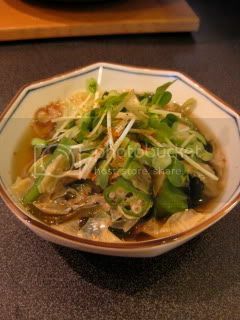 I find often the simplest way of preparation makes a ingredient testes best, and I also find it's often realized by Iga-yaki donabe. 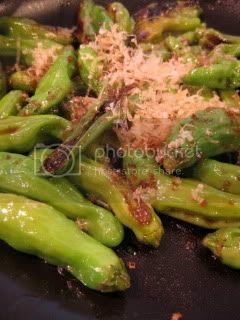 This donabe steam-fried shishito peppers is one of them! Honestly, I think this was the best shishito dish I've had. 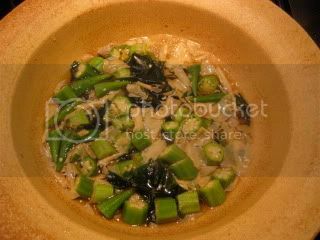 All you need is basically a bag of shishito peppers, oil, and a tagine-style donabe, "Fukkura-san". 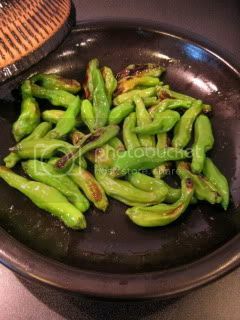 Here's the recipe (if you call it a "recipe")...I heated about 1 tablespoon of sesame oil in the skillet of the "Fukkura-san" over medium+ heat, add 3/4 pounds shishito peppers (stems removed). After quickly stir to have the peppers coated with the oil, cover and let it steam-fry for about 4 minutes. 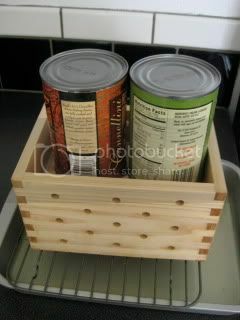 Uncover, stir, and cover again, then turn off the heat. Let it rest for 3 minutes. The sizzling steamy shishito peppers are ready! Wait...to finish, I sprinkled some bonito flakes and drizzled some soy sauce. 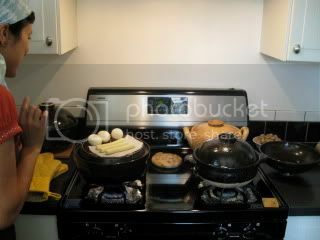 Because the pan is still extremely hot, the sizzling soy sauce made the wonderful "toasty" aroma. 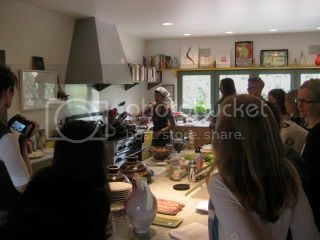 The dish was really outstanding. 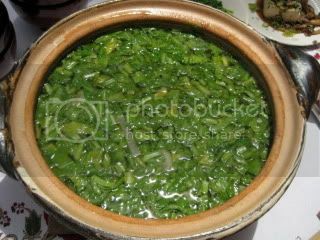 Because of the intense heat and the steam-effect inside of the tagine-style donabe, the peppers were cooked perfectly while the flavors concentrated. 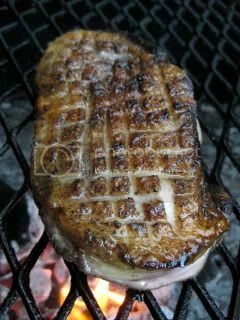 We grilled muscovy duck breast on our Santa Maria BBQ Grill a few nights ago. 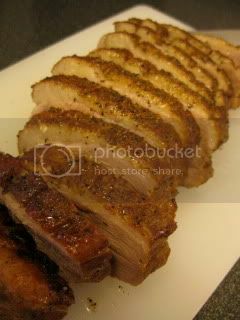 The duck breast was so thick and really beautiful looking. 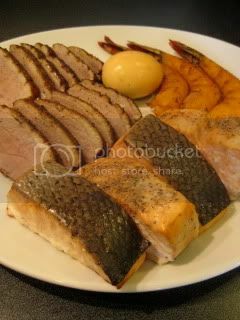 We got it from McCall's Meat and Fish. I seasoned the breast with only salt and pepper. It was let rest in the fridge for one day, brought back to the room temperature, and put on the medium+ heat on the grill over mesquite charcoal. I grilled it about 8 minutes each side. The sizzle from the skin sounded so nice. I checked the doneness with my finger...when the meat felt bouncing back easily, I pulled it off the grill and let it rest (covered with the aluminum foil) for about 10 minutes. Yes! The meat was perfect medium-rare! It tasted so juicy, and succulent. Again, with the aroma of charred mesquite, the meat was so flavorful that it tasted beautifully without any sauce. But, since I still had some leftover creme fraiche, I made a quick creamy wasabi sauce and served with the meat. 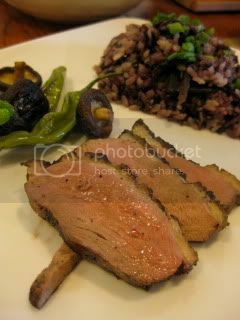 We enjoyed the grilled duck so much! 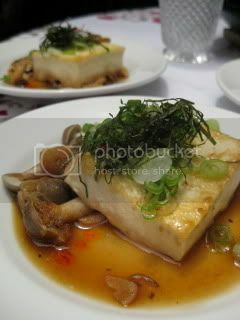 Some more tofu dishes last week. 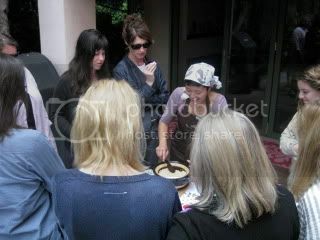 I feel a little too tired to write down the recipes today, so I just post the pictures. 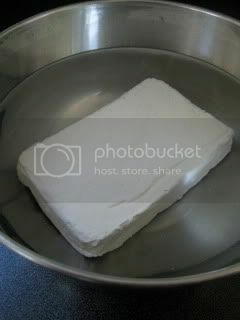 Making homemade tofu with donabe (I use the classic-style all-purpose donabe) is one of my stress relievers. Once the soy milk is curdled in the donabe, it's transferred to a wooden mold. 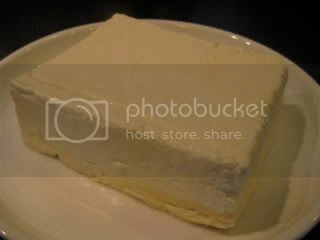 After about 15 minutes in the mold, the very natural rectangular tofu is ready. The freshly made tofu taste so nice with the simple soy sauce and shaved bonito flakes. 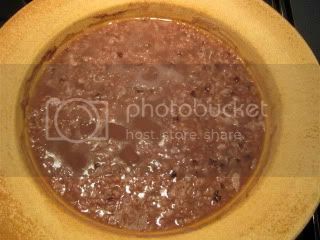 I also made the Chinese-style hot tofu saute by using the tagine-style donabe, "Fukkura-san". 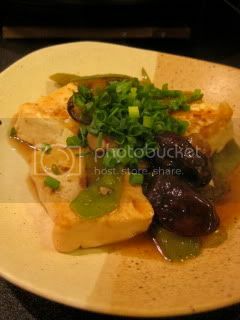 With this donabe, the ingredients cook fast and tofu becomes very fluffy. 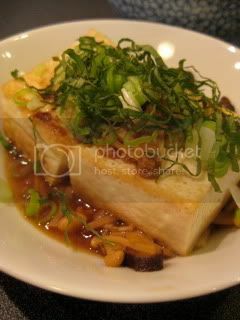 Once shaped tofu can be mashed again for this traditional Japanese salad, called, "Shira-ae". I use the traditional Japanese mortar and pestol (suribachi and surikogi) to mash the tofu with some shiro shoyu, sesame paste, etc. The texture becomes very creamy. 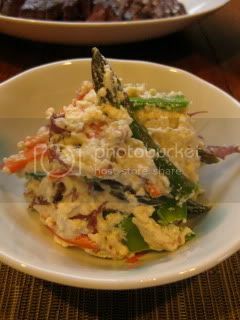 To finish, it was mixed with the blanched asparagus, carrot, and seaweed. Flat iron is a beautiful cut of beef. 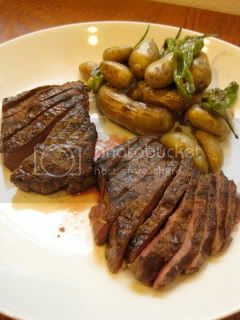 It's naturally so flavorful, has the nice density (but not chewy), yet it's leaner than other steak cuts. Our summer barbecue season is here. Jason fired up our Santa Maria BBQ Grill again for dinner. The flat iron was seasoned simply with salt, pepper, and olive oil. It was rest for about 4 hours with the seasoning. 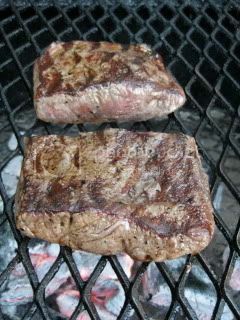 The grill was set at medium-high heat with the mesquite charcoal, and the meat was grilled for about 5 minutes each side for nice medium-rare. It was covered with the foil and let rest for additional 5 minutes. 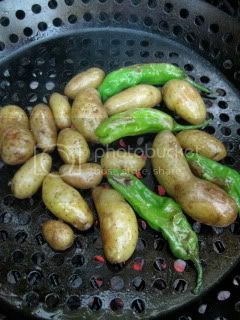 I also grilled some fingerling potatoes and shishito peppers. We enjoyed another simple but beautiful barbecue dinner. The meat was served with some lemon wedges and quick creme fraiche & yuzu kosho condiment (1/4 cup creme fraiche, 1 tablespoon yuzu kosho, and some minced Japanese baby scallion). The meat was so juicy and packed with flavors. Really delicious.